Thanks to some great feedback from commenters, I have a bunch of movies about procreation and parenthood to preview, for possible use in an ethics class I'm teaching in the fall. Movies are often used in philosophy classes to enliven topics like skepticism, free will, time travel, and personal identity, but I think they're going to be really helpful in this class. Reason: college students have not had a lot of first-hand experience with procreation and parenthood, or if they have, they're not likely to want to talk openly about their experiences. So making the issues palpable through film is going to help ... I hope. The first two movies I've previewed are Juno and Vera Drake, both movies that deal with abortion. 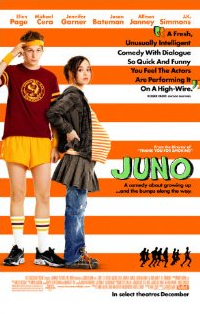 Juno is a wonderfully quirky and entertaining movie about a funny, independent-minded 16-year-old girl who gets pregnant, heads for an abortion clinic, and then turns around and decides to have the baby and give it up for adoption. The movie comes across as being about one person's decision. It's not prescriptive and judgmental. Yet it does deliver an interesting message: while it would be permissible for Juno to have the abortion, it's admirable that she doesn't. She is a good Samaritan. This movie would pair very nicely with Judith Jarvis Thomson's famous article "A Defense of Abortion," or with Rosalind Hursthouse's "Virtue Theory and Abortion" (thanks to Aeolus for the latter suggestion). I think it would easily generate an interesting discussion about whether it really is admirable to continue a pregnancy. What's admirable about it? If a fetus, early on, is really just "nothing," what's so admirable about letting it gestate to the point that it is "something"? In combination with one or both of those articles, the debate about this movie could have some philosophical heft. Less philosophical but also interesting, there are issues to discuss about the way the movie represents the choice not to abort. Juno makes this choice under no pressure from her parents or boyfriend, and with no religious influences. She is a free-spirit -- entirely her own person. In fact, she is exactly the kind of girl who (in my experience) will actually take control of her life and end an unwanted pregnancy. So does the film lie to us? Maybe. This qualm doesn't detract at all from classroom potential, as the issue of the movie's truthfulness would be grist for discussion. 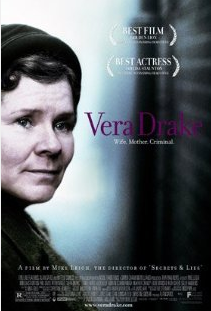 Vera Drake is a very, very fine Mike Leigh movie about a woman who "helps girls" in 1950s England, with tragic consequences. After a house of cards is set up in the first half of the movie, it's riveting and heartbreaking to see them all come down in the second half. What's particularly brilliant is the way we see that there is no one to blame except ... well, I won't spoil it for you. The portrayal of the woman's family and all the other people involved is fascinating and touching. Classroom potential? The message of the movie is that if abortion were illegal, women would have them anyway, and they would be unsafe. American students take for granted the availability of abortion, so it would be helpful for them to get a glimpse of life when it's illegal. But that would only provide them with valuable factual background. I don't think the movie really stimulates thinking about the ethics of abortion, as fine as it is. American students will also, I suspect, find the movie slow, and the lower class British accents incomprehensible. They will find Juno relevant to their own lives, but (I worry) would find Vera Drake distant and irrelevant. Still: it's a great movie, well worth seeing. As much as I'd like to take credit for it Aeolus deserves the credit for the hursthouse and Juno rec. (I would I have recommended Juno, but Aeolus beat me to it.) BTW the soundtrack to that movie is great too! Whoops--I'll fix. Don't think I noticed the soundtrack a lot, but the cinematography is very nice. All around, a good, interesting movie.